Osteopathic Manipulative Treatment: How Osteopathic Manipulative Treatment can help a patient in treating slipped disc? This blog periodically lists news and interesting facts about Osteopathic Manipulative Treatment.Osteopathic manipulative treatment, or OMT, is hands-on care. It involves using the hands to diagnose, treat, and prevent illness or injury. Using OMT, your osteopathic physician (D.O.) will move your muscles and joints using techniques including stretching, gentle pressure and resistance This website is meant simply for learning and spreading the word about OMT. Reader input is highly encouraged. How Osteopathic Manipulative Treatment can help a patient in treating slipped disc? The spine is made up of the vertebrae (the bones making up the spine), which have cartilage discs between them. The discs consist of a circle of connective tissue with a central gel-like core. This makes the spine flexible and at the same time acts as a protective buffer. In the centre of this column of vertebrae and discs is the spinal canal, which contains the spinal cord stretching from the brain-stem down to the first or second lumbar vertebra. It continues as a bundle of nerve fibres called the cauda equina stretching down towards the sacrum, which is the extension of the spine. Between each vertebra, the spinal cord has nerve root connections to other parts of the body. the lower back (lumbar vertebrae). A slipped disc is when the soft part of the disc bulges through the circle of connective tissue. This prolapse may push on the spinal cord or on the nerve roots. However, it is worth noting that 20 per cent of the population have slipped discs without experiencing any noticeable symptoms. 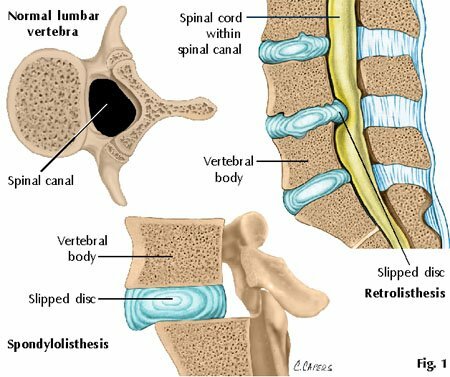 The term 'slipped disc' does not really describe the process properly - the disc does not actually slip out of place, but bulges out towards the spinal cord. A slipped disc occurs due to the breaking down of the circle of connective tissue with advancing age. This causes a weakness allowing the soft part to swell. Slipped discs most often affect the lower back and are relatively rare in the chest part of the spine. It is possible that hard physical labour can increase the likelihood of a slipped disc. They are also occasionally seen following trauma such as an injury from a fall or a road traffic accident. At what age can a slipped disc occur? A slipped disc in the lower back is most often seen between the ages of 30 and 50. In the cervical vertebrae around the neck, slipped discs are most often seen between the ages of 40 and 60. Paralysis of single muscles, possibly with pain radiating to the arms or legs. There may also be a disturbance of feeling in the limbs. Disturbance of feeling, muscle spasms or paralysis in the part of the body below the spinal cord pressure. For example, pressure on the spinal cord in the chest area will cause spasms in the legs but not in the arms. Pressure on the spinal cord may cause problems with control of the bladder. It is possible to make a diagnosis from the patient's history and the doctor's physical examination. In many cases it is possible to determine which disc is affected. This can be confirmed either by a CT scan, MRI scan or a myelography - an injection into the spinal cord canal. The doctor will decide which examination is necessary. An ordinary X-ray of the spine is usually taken as well, but is much less use diagnostically than a scan or myelogram. It is important to make a correct diagnosis because several other diseases have similar symptoms. Any 'red flag' symptoms must be acted upon without delay. It is generally agreed that a slipped disc should be treated conservatively, with surgery being considered only when other approaches to treatment have failed. The treatment will typically mean a brief period of bed-rest with appropriate painkillers. Physiotherapy or chiropractic treatment should also be explored. Whether to have an operation or not, is a decision for a specialist. When there are symptoms of pressure on the spinal cord or on the cauda equina, an operation should be performed as soon as possible. Cases involving serious or increasing paralysis should be treated as an emergency and admitted to hospital for assessment immediately. When there are changes in the symptoms, a doctor should be consulted. Significant changes in bladder habits or control, increasing paralysis of the limbs or muscle spasticity should always receive immediate medical assessment. .
Osteopathic treatment will decrease the recovery time enabling the patient to get back on their feet quicker. The osteopath will reduce the muscle spasm, which causes much of the pain and reduce the pressure on the nerve. The treatment also reduces the chance of scar tissue forming at the disc thereby reducing the chances of recurrent injury.The osteopath will not just treat the area of pain but also surrounding areas to reduce the pressure on the injured disc. What can the patient do at home? - rest for 1-2 days in the foetal position or lying on one’s back with 2 sofa sized pillows under the calves. - apply an ice pack to the back for 15 minutes (not the leg) each time, every 2-3 hours for a period of 48-72 hours. - anti-inflammatory tablets can be taken under the guidance of one’s GP. - No lifting nor sitting on low chairs or sofas as this stresses the injured disc. After 24-48 hours manual treatment should be started. Long-term bed rest does not help the healing process. Mind Body and Spirit: Total Body Healing! Which of the following is the most commonly used OMT technique according to you?